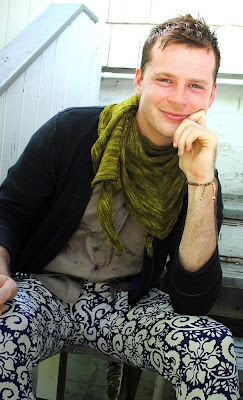 As we continue down the path of highlighting designers who are participating Pro-Verbial Yarn & Fiber Club 2010, we will now meet Stephen West. Where do I begin with my thoughts of Stephen's work? Let me state the obvious. I adore how he has taken the structure of a shawl and turned it on its head. Before I knew of Stephen's work, if you said the word shawl to me, right or wrong, my mind would jump to matron, lace, pale in color, lightweight, triangular. 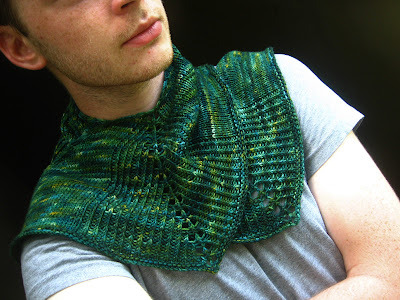 Stephen has completely changed the look and feel of what many of us may consider a shawl to be. He works mainly sans lace, mostly in stockinette with highlights of ribbing and striping. And, he has pulled apart the triangular shape into a variety of shapes and forms. His work is extremely wearable for both genders. His designs are classic, elegant, and partners extremely well with hand-dyed yarns. For all of the reasons above, I thought Stephen a great fit for this club. I can not wait to see what kind of work he will create. I feel like I have a special connection to Stephen's work. When Adrienne's sister-in-law, Donna, was undergoing chemotherapy, Adrienne and I co-knit the Daybreak shawl for her. This was a very straightforward project, technically feasible for both Adrienne and myself to knit, and left us a lot of room to think about Donna, while creating something really beautiful for her. I hope you will enjoy this interview with Stephen as much as I have. It initially occurred to me after I had designed my first pattern. The owner of my local yarn store (Klose Knit in Urbana, IL) asked me to write up a pattern for the local arts festival. I had a version of a triangular shawl that I hadn’t seen published yet and I was done with the knitting so I figured out how to write the pattern and called it Boneyard Shawl after the Boneyard Arts Festival. The reception to the pattern was great in the shop as well as on Ravelry. That encouraged me to create more designs. It’s usually the most recent design I finish! Daybreak and Botanic hat are probably my favorite to knit, but my green Herbivore and red Windschief hat are the pieces I wear most. *Stephen wearing his Herbivore. Mostly, it’s other knitters and designers. 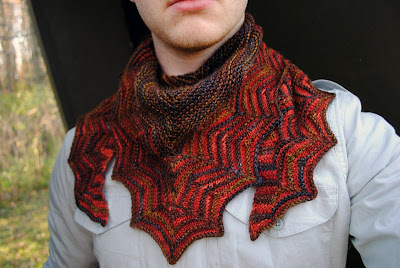 I am so inspired by the beautiful finished objects created by knitters that I see every day on Ravelry. It feels amazing to know that what I’m designing is something that is appreciated and it’s what others want to create too. Picking out yarns and colors! A shawl/scarf with garter stitch, interesting construction, and a fun color combination. I like to knit while watching movies or listening to music. I know other techniques like fair isle, intarsia, and lace, but I prefer simple knits. I don’t feel like I have a choice! It’s just so wonderful to work with and there are countless quality yarns and colors out there. Not too far back because then there would be no Ravelry. The first time I ate a s’mores cookie from a local bakery earlier this spring was definitely a highlight. I would love to experience that moment again. When I’m designing I can’t live without: pen and paper. My favorite tool to assist in designing is: my computer. I finally learned to type out a pattern as I work on it rather than try to read my “beautiful” penmanship. Other independent designers. Some of my favorites are Ysolda Teague, Jared Flood, and Gudrun Johnston among many others. If you could be anywhere in the world knitting, you would be: anywhere cold with a cozy remote cabin and a fire going. It would be ideal if the remote cabin had access to pizza delivery as well. What intrigued you to work with AVFKW yarns - and/or to be a designer for the Pro-Verbial Yarn Club? The yarns are so unique and the colors sing to me. I only l work with yarns I love so it was easy to say yes to AVFKW. The rustic quality of the yarn really stood out. I have not worked with anything like it and I think it would be showcased wonderfully in one of my patterns. Can you give us a lil’ hint as to what you will be designing for the Pro-Verbial Yarn Club? I usually design as I go and often make changes, but you can expect an uncluttered pattern with simple clean lines. Stay tuned for our next interview with the fabulous Mary-Heather Cogar. Please note, if you have emailed me to be part of Early Bird sign-ups, look for an invitation on this upcoming Sunday, August 15th. Kristine, what a wonderful interview. Now, do you think Stephen would like to come to my place in MN and work on his design for the Pro-verbial 2010 Club? My place is remote, it gets really cold in the winter, there is always a roaring fire in the fireplace....and we do have pizza but no delivery, we would have to drive into town to get it. O.K. so who else loves Stephen's pants? Wild, no wonder he is so creative.